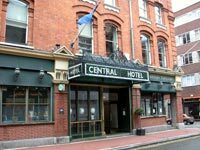 Providing excellent service since 1887, the Central Hotel is a delightful and stylish establishment offering great comfort and service to detail. Located in the heart of Dublin, making it an ideal venue for a celebration, business or shopping trip or a romantic weekend. For the explorer many of the Dublin’s wonderful sights are near at hand. The hotel offers 70 en suite bedrooms and suites all of which are endowed with the utmost charm providing peace and tranquility These stunning offer all facilities necessary for comfort and convenience and to make your stay a memorable experience. Facilities include direct dial telephone and colour television. The staff are well known for their welcome and attention to detail. Only the finest of meat, game, fish and Irish vegetables are used in the wonderful meals in the Dining Room. The hotel offers a very impressive wine list to complete the dining experience. The library Bar is a haven of peace and tranquility and is very popular for business meetings, morning coffee, light lunches and pre dinner drinks. The hotel provides state of the art conference facilities for up to 150 people. The Central Hotel is located right in the heart of Dublin's City Centre. The ideal location as cosmopolitan Temple Bar is on one side with its great night life and attractive cobblestone streets. And for an enjoyable shopping experience Grafton Street with its array of shops is on the other side. Theatre lovers will be spoiled for choice as the main theatres are all close at hand. The great tourist attractions of Dublin Castle, Christchurch Cathedral, Trinity College, the National Gallery and the Guinness Brewery are all close by.